Where: Anywhere in the world! Online or otherwise. Hey guys - started a bit later this year but guess what! It's time to play games for 24 hours and raise money for kids. That's right - Extra Life 2018! Basically, Extra Life is a charity event held once a year usually in October or November in which the participants play games for 24 hours. (Usually they do it over the course of that weekend - but it's all based on honor system so you can make up the hours too.) Think of it like a gaming marathon - with any kind of game. Board games, card games, video games, you name it! Someone pledges money to you, and you game on for a total of 24 hours. A lot of people set up Twitch.TV Streams too, to raise awareness - but you don't have to. It's all honor-system! It doesn't matter too much anyway since the donations are what matter. It's still for a good cause. It goes to local Children's hospitals to help kids fighting all sort of nasty things like cancer and other diseases! Since 2008, Extra Life has raised more than $22 million to help children's hospitals provide critical treatments and healthcare services, pediatric medical equipment, research and charitable care. Join in and raise money as a participant - whether apart of a team or individually. You can check out my team I made and select "Join Our Team". Spread the word! Spread the links of any participating teams and individuals, both streams and donation pages. Donate! Any amount will do. $1, $5, even more. Any little bit helps these kids in need. Just click on any participant's link (or the team's link) and then click on the "Donate" button on their page. It's safe, and easy to do! Extra Life raises millions of dollars each year to help kids. Each year we always set that goal higher and higher. So if you're interested, please help out! Any little bit helps. We can't do this without folks like you. The GW2 community is known for being welcoming and helpful to players of all types. Let's show folks out there how helpful we can be. Be sure to comment below with your donation page (and stream link) if you plan on participating. If you'd like to advertise your team as well, feel free to add that to the thread as well. Let's get more people participating! As Wintersday begins to approach, the charitable atmosphere already fills the air as we finish our shopping sprees. The season of Colossus is brought to an end with the distribution of gifts amongst our closest friends, starting the season of Zephyr in the new year with a wonderful glee. The warm feeling of seeing the delight on our friend's faces is enough to get us through even the darkest times. Despite not being out among the front line of Jahai Bluffs, there are many children fighting wars of their own. They are struggling valiantly against a variety of conditions and diseases. These kids need our help - so will you take a moment from fending off Kralkatorrik to lend your assistance? Let us bring a smile to these children's faces in time for Wintersday. The Tyrian Charity Foundation is on a quest help sick and injured kids in our local communities. 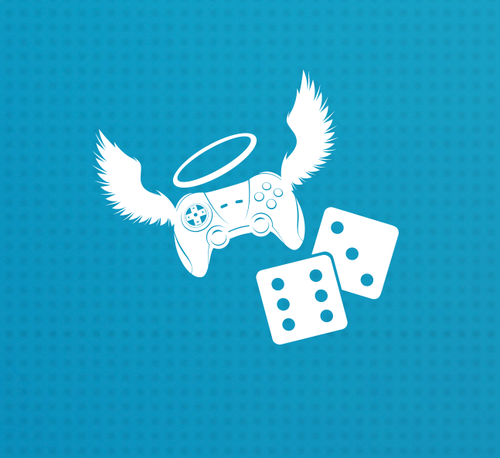 To fulfill this quest, we (and other Extra Life participants) will be gaming for 24 hours from Saturday, November 3 to Sunday, November 4, starting at 8 AM and ending at 8 AM. Through this 24 hour event, we will be raising money for our own, chosen local Children's Miracle Network Hospital. The money we raise will be used to treat thousands of children each year, regardless of their illness, injury, or even their family's ability to pay. Your donation will allow for a Wintersday miracle to happen for families that desperately need them. Every donation donation matters, and they are even tax deductible! To make a safe and easy online donation to a member of our team, click on the "Donate" button at the top of the team page! If you cannot donate, then spreading the word helps as well. You can even support us by watching us stream. Any little bit helps, and we can't do this without you! Please visit our team page here for more information. Thank you so much for supporting our efforts and helping these kids! Otherwise, please spread the word on there as well. Hey everyone! Looks like ArenaNet will also be doing Extra Life for their second year in a row. 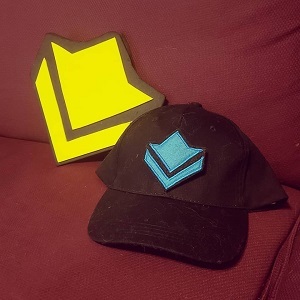 This time around, too, they are now a Super Team and will be featured on the official Extra Life twitch page! Now with Team ArenaNet as a Super Team, this means is that now YOU can join the ArenaNet Extra Life team two different ways. You can either join their team directly, or join as part of a subteam. A subteam works like any normal participating team for Extra Life. Your goal simply is added to Team ArenaNet's total, as well as your own. Plus you get listed on their Super Team Page. The Tyrian Charity Foundation recently got converted to a subteam under Team ArenaNet. If you're still looking for a team to join, please consider joining us there. Otherwise you can see the multitude of teams under them - or join Team ArenaNet directly through "Join Team ArenaNet". Can't wait to see what sort of shenanigans we can get up to this year. Hope to see you all joining us in on the fun, and helping us help these kids out! As a reminder, this is this weekend! Spread the word, and let me know if you are participating! It’s the Friday before Extra Life! Time to make an extra push today by self-plugging my own page. You will find me streaming on my Twitch channel starting 8 AM PST on Saturday Nov. 3. 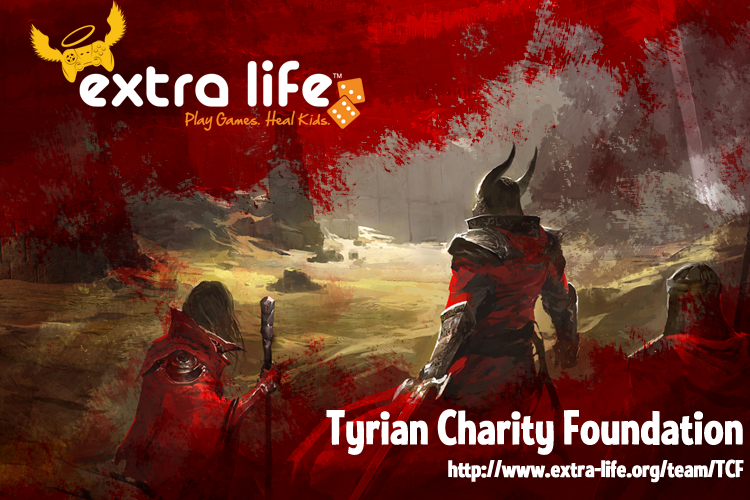 I will be playing under team Tyrian Charity Foundation, which is under the superteam Team ArenaNet. Another member of the RP community will also be raising money on Saturday. Come join me, spread the word, or donate! It's game day, everyone! Let's help those kids. Thanks to everyone's donations, we reached $432 out of our $500 goal. We also helped reach Team ArenaNet's goals, which resulted in us getting a hilarious Fear Not This Night video and a game-wide buff. This was all because of YOU. You made a huge difference and decided to help out. These funds will help alleviate a lot for these kids and their families when they need it the most. So thank you so much. But it isn't game over yet. We will still be taking donations until Dec. 1st! So if you'd still like to help us reach that goal before then, donate or spread the word. Let's get TCF to the top of Team ArenaNet's leaderboard!